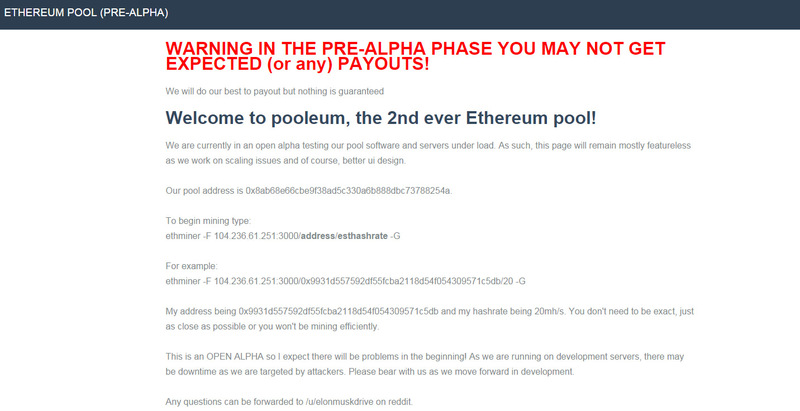 Since Ethpool, the only Ethereum pool up until now, stopped accepting new miners everyone else that wanted to mine for Ether (ETH) had to go solo mining. The good thing is that the community has reacted to this and started working on solutions to this problem with a Bounty being offered for an open-source Ethereum mining pool and releasing a new mining pool even though it is still in pre-alpha phase and there could be a whole lot of issues with it. 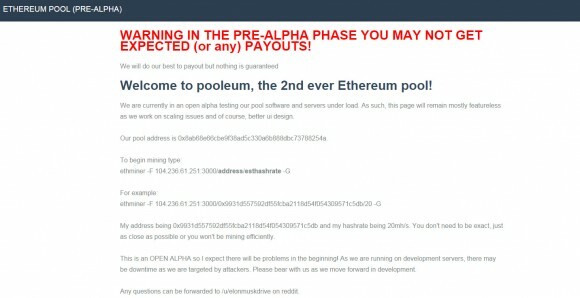 The new mining pool for Ethereum is called Pooleum and it functions in a very similar way to Ethpool, essentially offering an alternative, though it is not yet so nice looking or with the full functionality. As already mentioned it is in pre-alpha stage and needs some work, but you can try mining with a single GPU if you have more than one at the new pool and reporting any issues you may find, so that we can get a good working alternative to Ethpool in no time. You can use our Quick Guide on How to Mine Ethereum on Windows to get started with the new pool, just replace the pool information, the rest is the same. Update: We would advice to avoid this pool as apparently it has been left nonfunctional refusing connections for over 24 hours already!